A Better Workplace for a Better You. With our headquarters in the historic and scenic Warehouse at Camden Yards, eOriginal continues to employ the best and brightest people. We are always looking for people seeking an organization with true entrepreneurial spirit to help us maintain our lead in the secure eCommerce market. We’re dedicated to providing our team with a diverse and dynamic work environment that embraces flexibility, creativity and opportunity. See our Job Openings, Perks, and Benefits below! The quarterly Shining Star initiative showcases employees who have gone above and beyond to improve business outcomes for our customers and to enable the success of fellow team members. The eOriginal Shining Star recipient(s) receives a cash award, plus a shining star award. eOriginal offers employees comprehensive medical coverage through Cigna HRA Open Access Plus Plan. This plan allows employees the freedom to seek health care from Cigna’s large network of health care providers. The HRA OA Plus Plan is a High Deductible Health Plan and is paired with a Health Reimbursement Arrangement (HRA). An HRA is a financial account that you can use to pay for qualifying health care expenses and is funded and owned by eOriginal. Plan deductibles for individuals and families are paid 100% by eOriginal, while employees are offered highly competitive bi-monthly payroll deducted premiums. Cigna is our provider for our dental coverage, providing both in-network and out-of-network coverage. We have two great dental plans to choose from, a PPO plan or a Dental HMO plan. Vision coverage is offered through Cigna and allows you the option to visit an in-network or out-of-network provider. Cigna provides disability insurance without having to pay premiums. eOriginal provides Basic Life and AD&D Insurance at no cost to you with the ability to purchase additional coverage for you and your family. Save for your retirement by participating in our 401(k) plan. You will receive a 100% match on the first 3% of your eligible compensation that you contribute, and 50% deferrals over 3% but not exceeding 5%. Our time off policy allows employees the ability to manage their time in an effort to achieve work and home/life balance. We observe seven paid company holidays per year for you to spend time with family and friends. In addition, you will receive two floating holidays per year, plus vacation days and sick time. Your personal and professional development & growth continues with eO University trainings sessions as well as our monthly in-house Lunch & Learns. These engaging programs allow employees to keep up to date on new company products, industry knowledge, and also help to introduce new organizational initiatives. We offer a wide variety of opportunities to get involved within the community. 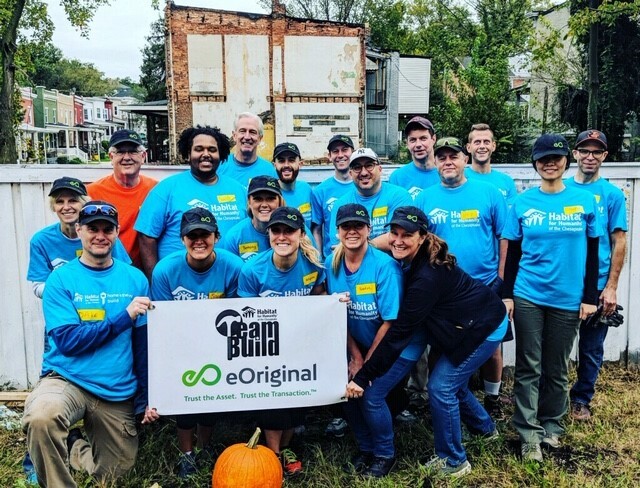 You can volunteer to work on the restoration of homes with Habitat for Humanity, participate on the eO sports team through Volo City Kids Foundation (a non-profit organization providing leagues in various cities for children to play sports at zero cost to their families), and/or donate to our annual Angel Giving Tree initiative through the Salvation Army. This initiative showcases employees who have gone above and beyond to improve business outcomes for our customers and to enable the success of fellow team members. The eOriginal Shining Star recipient(s) receives a cash award, plus a shining star award. eOriginal offers employees a business casual dress code on a daily basis. Friday’s during baseball and footballs seasons you’ll see many team shirts sported! Enjoy free parking in the Oriole Park at Camden Yards parking lot right outside the office as one of our many perks to our employees! GROW (Go Recruit Outstanding Workers) is eOriginal’s Employee Referral Program which pays a bonus for referrals who are submitted, hired, and become full-time eOriginal employees. We encourage all employees to refer qualified friends and former colleagues you feel would make valuable additions to our eOriginal team.